James Archer (£500 Award), now a construction apprentice with the Canal & River Trust, specialising in masonry skills. James ‘shares his skills with others [and] has given training sessions to the team and volunteer groups around the traditional skills of mixing and working with lime mortars’. He has ‘great passion for the waterways’ while ‘in addition to his paid work at the Trust, he volunteers with the Waterways Recovery Group in his spare time, to help to restore disused/neglected canals around the country’. He ‘has also recently volunteered at the Transylvania Trust, Romania, where he carried out work at Banffy Castle’. Ken Burley (£500 Award), ‘a keen RTPI and IHBC Member’ for his work with the South Yorkshire Buildings Preservation Trust, especially in ‘enabling its talented members to work to their full potential to achieve a successful outcome despite the formidable challenges’. All three have the chance to attend the IHBC Full School (Residential) in Manchester, 22-24 June, themed on Transport Infrastructure, and valued at up to £500. The programme includes the IHBC’s Annual Dinner where the formal presentations of these well-deserved awards will take place, along with the presentation of the Gus Astley Student Award 2016. Cash prizes are awarded by the Marsh Christian Trust, while the offer of free places at the 2017 Annual School in Manchester is sponsored by the IHBC. 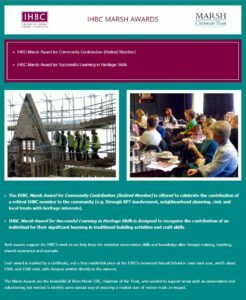 Brian Marsh, inspiration and behind the Marsh Awards, said: ‘We are pleased to be able to work with IHBC for the second time to deliver these Awards, recognising those who have dedicated a lifetime to heritage conservation and those who are dedicated to heritage learning and development. The next IHBC Marsh Awards will close in 2018, so be sure to start planning your nominations now! For more on the annual IHBC Marsh Awards for community contribution and successful learning see the IHBC Marsh Awards website and for background see the NewsBlogs.